Why Are There So Many Bluff Shelters in the Ozarks? 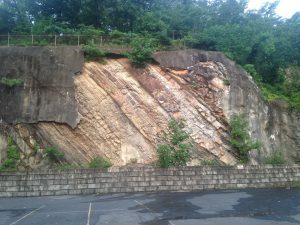 Example of folded and faulted strata from Hot Springs, AR in the Ouachita Mountains. The unique way the Ozark Mountains were created led to the formation of many bluff shelters and made it possible for the rare cultural resources found in the shelters to be preserved. The Ozark region, which occupies primarily northern Arkansas and southern Missouri, is different than most mountain ranges in the United States. Generally mountains are formed by what geologists call folding and faulting. That is, rock strata or layers are bent, folded, and changed by the action of large sections of the Earth’s crust pushing against each other. This creates wrinkles and bumps in the strata and lifts the entire region. The Ouachita Mountains in Arkansas are an example of that. You can see evidence of it in the way the rocks look folded and bent. The Ozarks were formed in a different way. They are the result not primarily of folding and faulting but of erosion. The rocks that formed the Ozarks were originally sand, silt, and the remains of marine animals laid down in a shallow sea at the beginning of the Paleozoic Era, which began 542 million years ago. These deposits of sediment were put down in layers as the environment and sea level changed over time. Thus layers of sand were deposited on top of layers of finer grained silt, and in some places the remains of calcium-rich corals and the shells of sea creatures created layers on the sea bed. As time progressed this layer cake of sediment became rock. The sand layers became sandstone, the silt layers became shale and siltstone, and the shells and coral became limestone. The result was a mostly flat, slightly southward-sloping area of interbedded limestone, sandstone, shale, chert, and siltstone. In the Late Paleozoic Era the region experienced a broad area of geologic uplift. The elevation was raised and a large dome-shaped plateau was formed, but the original rock strata, or layers, were not disrupted. Interbedded limestone and chert at Breckenridge Shelter, Carroll County. The bluffs on the Buffalo River near Steel Creek campground, Ponca, AR. View from the bluff. So how did this layer cake of rock become a mountain range? 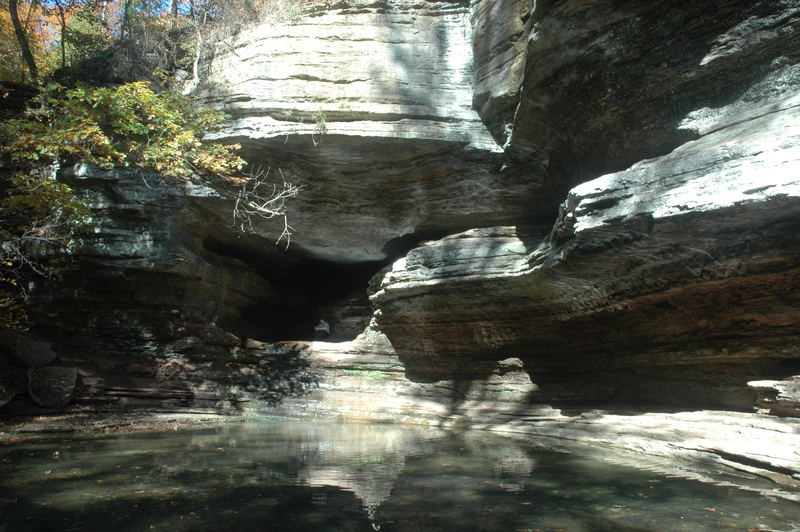 As the uplift took place the rivers in the region began to erode their stream beds deeply into the layers of mostly flat rock, exposing the strata in bluff faces like this one on the Buffalo River. This took considerable time but the result is rather spectacular. So the Ozarks are not so much a mountain range as a very very old eroded plateau. 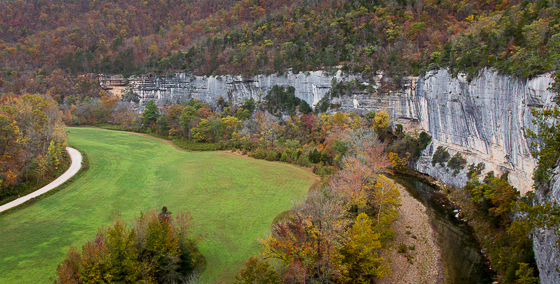 The differential rates at which the different layers of rock in the Ozarks eroded led to the creation of step-sided mountains as well as sheer bluff faces. It was this process that gave the region its distinctive flat-topped ridges and narrow hollows. Where rivers create bluff faces out of interbedded rock layers, bluff shelters can form. 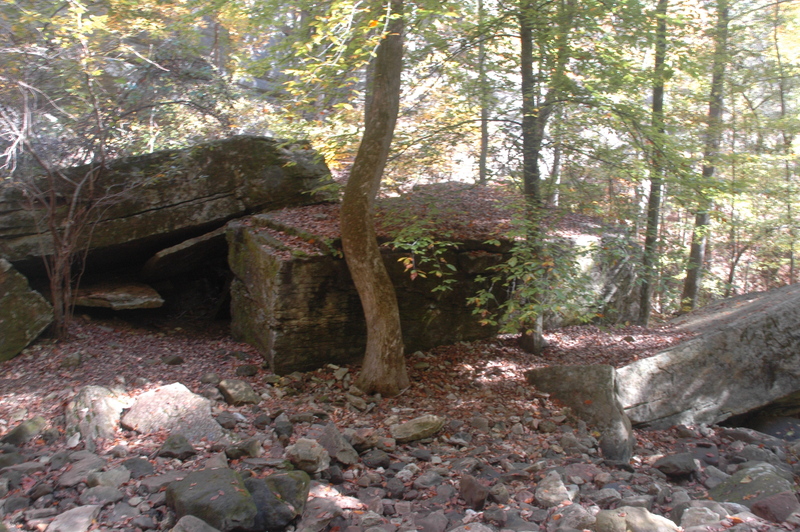 The way the Ozark Mountains formed makes them an ideal spot for the formation of bluff shelters. The interbedded sandstone and siltstone or shale layers are acted on by water seeping into tiny cracks and spaces in the rock. This causes the different layers to separate where they adjoin each other. 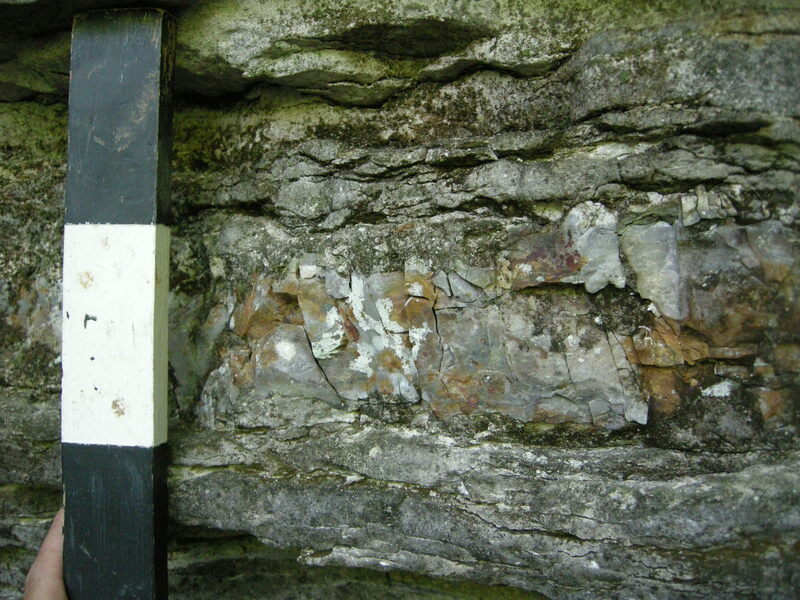 Over time the rock with the smaller particles, the shale and siltstone, wears away faster leading to instability in the architecture of the bluff line. Collapse occurs and creates a space in the cliff face and an overhang is formed. This overhang is then widened by further erosion and more collapse which is sometimes called roof fall. The dryness of these shelters made them particularly attractive to the people of the region, and many of the shelters in the Ozarks were used by people off and on beginning as early as 10,000 years ago until the nineteenth century. They are locations that still attract people today. The dryness of many of the shelters means exceptional preservation of materials from the past that usually rot away when exposed to water. Water dripping off of a bluff line outside of a bluff shelter in the Boston Mountains. Dry shelters such as this provide a good preservation environment for archeological deposits. In addition to bluff shelters, the limestone in the Ozarks also led to the formation of true caves through a different process. There is some overlap between caves and shelters. Sometimes cave entrances resemble bluff shelters, and sometimes the collapse of a cave can form a bluff shelter. 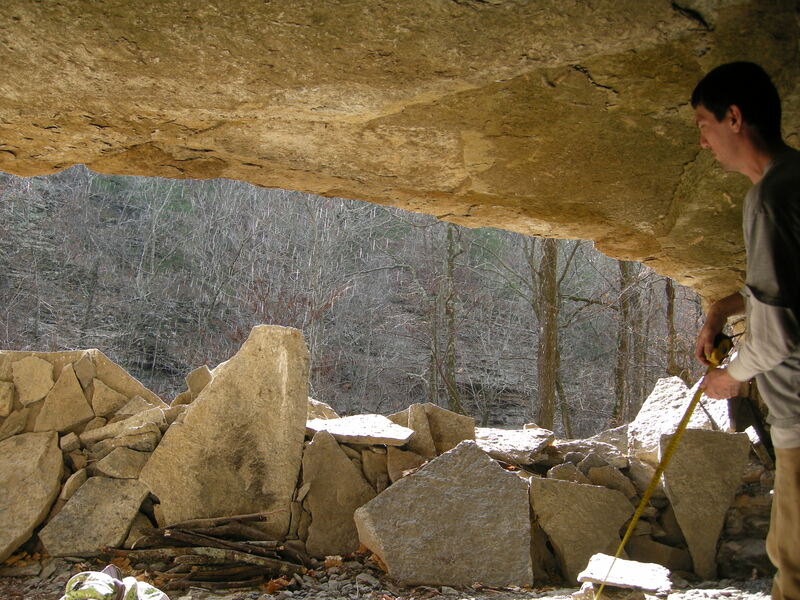 Both caves and shelters were used by prehistoric Native Americans in the Ozarks in similar ways. So what distinguishes a cave from a shelter? While sunlight penetrates all the way to the back of a bluff shelter, a cave is defined as an opening that is large enough for a person to enter and deep enough that sunlight does not reach the back. The formation of the many true caves in the region has to do with the limestone present in the layers of sedimentary rock. The minerals in limestone can be dissolved in water, especially rain water, that percolates down into the ground after combining with carbon dioxide in the atmosphere. This combination creates a very weak acid solution. This solution is strong enough to wear down the limestone over time and create holes and pockets in the rock. The underground water system that makes up the water table can form elaborate cave systems that include underground rivers and waterfalls through this process. Ozark geology lends itself to the formation of these kinds of caves known as solution caves or caverns. Caves were themselves the sites of human activity in the prehistoric past, but they can also, in some cases, become rock shelters. Lost Valley is a good example of this process. Lost Valley is now a part of the Buffalo National River, and is the home of a very large bluff shelter called Cob Cave that you can visit. Lost Valley was, in its past, not a valley at all but a very large underground cavern formed by the dissolving of limestone. At some point it became so large that it collapsed and formed a valley. You can still see part of the original cave that now creates a natural tunnel into the valley. A pool of water with a waterfall flowing out of a small opening in the bluff, known as the Natural Bridge in Lost Valley, Buffalo National River. The large blocks of rock littering the narrow valley floor were once part of the roof of the cavern. The bluff shelter known as Cob Cave is what was left of one side of the cavern. It was visited by Dellinger and his crew in 1931 and artifacts were collected from the site. It had long been known by locals and had been extensively looted before even the first archeologists visited the site.